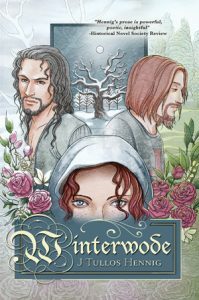 In due celebration of next week’s release of Winterwode, the Speculative Fiction Book Review is offering a giveaway on all three ebooks of the Wode! Go check it out! 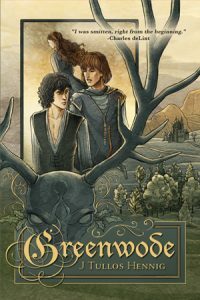 GREENWODE on sale – .99! The legend begins—with the “intensely emotional, breathtaking version of the Robin Hood Legend”! 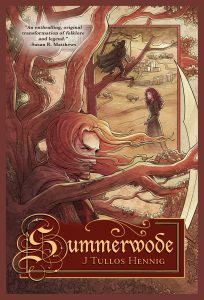 To celebrate Tuesday’s re-release of Shirewode, and for a limited time, Greenwode is on sale for .99! 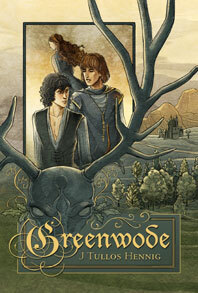 Visit the Greenwode page at DSP Publications, or purchase your ebook through other online retailers! But first, there was something I forgot to mention in the last bit about our trip to York. 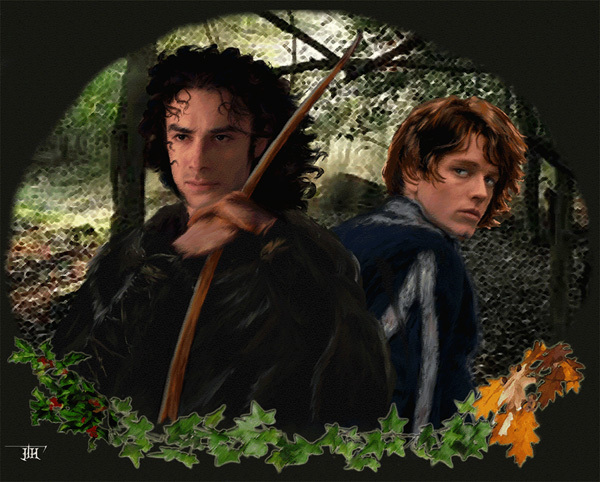 It must be important, because I have a legendary–and quite snarky–archer glaring at me behind a nocked arrow. 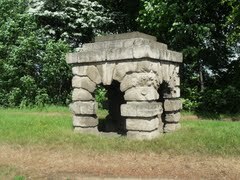 We passed by Robin Hood’s Well on our way to York. I mention this despite the fact that yes, such sites are arguably Tourist Central (again, the archer is glaring, and he is persuasive). And despite that yes, it is geeky beyond words that we passed it going at least 70 mph on the A1, and despite being taken away by such road signs as Blyth and Doncaster (more geekiness) and the lovely country, I nevertheless knew the Well by sight as we blipped past. All I could think the rest of the way to York, was how seeing it beside a busy dual carriageway would make Robyn cry. It is a knife edge of WTF, the way these amazing historical things coexist with modern disturbance. Amazing, for they are still there (unlike on this continent, where there has been a systematic purge of most of the Original Ancestors’ history), and sad, for they are being crowded out, in a very real sense. I’ve always had mixed feelings about the Wall. I put it down to genetic memory: my blood traces to varied indigenous peoples who have been driven from their homes or forced into places of metaphoric or real walls to control their ‘unacceptable’ ways of life. Part of me hails from those ancient Brythonic tribes who fought Roman incursion throughout what became the U.K. It’s safe to say I’m rarely on the side of colonialism, and arsy enough to give an archer’s salute to any invading people. But Amazing Spouse was adamant. And I was intrigued despite misgivings. The drive from York to our next night’s stay (closer to the Wall) was yet another amazing and scenic jaunt. 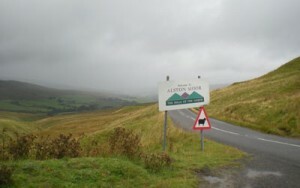 Rolling hills became more extreme the further north we went. Serious sheep country, with miles upon miles of rock fencing, easy to make impromptu gates–indeed, some of those walls already had been gated, and one had black-faced sheep spilling through. I wanted to be on a horse, at a spanking good gallop, clearing those fences. 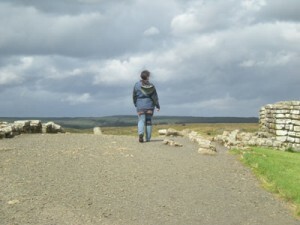 Our hostel for the night, Langdon Beck, is considered the ‘highest’ of England’s hostels. I suppose it could go both ways, for it is quite northerly into Northumberland, and we were indeed travelling more of those curvy, akin-to-mountain-switchback-sort of roads. It was coming on dusk when we finally pulled in the drive. By the by, if you’ve never stayed in a hostel, you should try it. No question the accommodations are plain and simple, so if you’re one of those who demands swank digs then you’re not likely to be satisfied with a hostel. But they’re adequate to the task, inexpensive and clean, and staffed by young people from all over the world. The man at the welcome desk told me he played ‘guess the guest’ through the surnames, and figured we were German. Considering that ‘Hennig’ in Germany is common as ‘Smith’ in the U.S., not an unfair cop. And not altogether wrong in Amazing Spouse’s case of heritage. … but there was a Wall waiting. Twenty cups of tea later (all right, I exaggerate, but only just), we made our way over more gorgeous, damp and wind-swept hills towards Hadrian’s Wall. We’d still not quite fully rendered the knack of traversing small towns, so stopped at a neighbouring Tesco, where we got our bearings. Amazing Spouse has a god-phone, and we had cause to be grateful to the bloody thing, but still, dammit, I wanted a map! Amazing Spouse’s Tesla jacket also garnered some geek boys asking questions. I retired from talk of rad cars and their electrons to find an Ordinance Survey, no more than 2-3 miles to the inch, thank you very much, and also the loo. Not necessarily in that order. Twenty cups of tea, remember? With the help of the O.S., we ended up at Housestead’s Roman Fort, an outpost upon a high point along Hadrian’s Wall, and one of the only places you’re actually allowed to walk atop the Wall at present. There is, of course, a hiking trail that parallels the Wall–all the way coast to coast, I do believe. Again, I wanted to take to the trail and just keep going. My Sullivan ancestors had to have had some tinker in them, from the gipsy leanings I have. But I’m getting ahead of myself. First we climbed uphill to the fort. 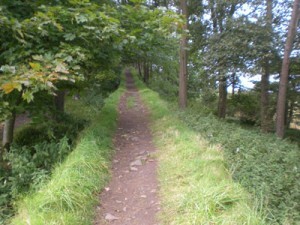 There are ‘most always ‘uphills’ to such places–defensibility, natch. The museum off to one side was our first stop–small but mighty, as was the film telling, in a remarkably short time span, much of the site’s basic history. (Also fun to realise that familiar narrative voice was Bernard Hill, who was Theoden in film Lord of the Rings and who, I understand, will be in the upcoming film adaptation of Wolf Hall.) Some exemplary objects they’ve found onsite were also on display, some of them so lovely and crisp that it was hard to reconcile them with cast-offs left buried in the ground for nearly two centuries. I’ve never understood how modern society can blithely make the assumption that ancients were unsophisticated. The museum prepared us wonderfully for our exploration of the fort itself. 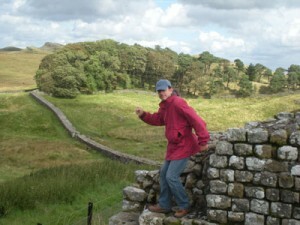 Eddie Izzard comes to mind, with his jokes about archaeological findings always being ‘a series of small walls’. (And if you don’t know who Eddie is, run–don’t walk–to find his comedy routines.) What’s left of Housesteads is indeed akin to ‘a series of small walls’, but the stories those rocks could tell! Have told. You’re atop their Known World here, battered by wind and looking out over miles of countryside. According to the literature (which is impressive, and English Heritage, National Trust and Northumberland Nat’l Park deserve every scrap of funding they can get) there were around 800 people living here at what must have seemed, to them and at the time, the end of that Known World. One can decry invaders and colonisers–and rightly so!–but still, walking in the footsteps of normal people thrust into a world alien to them… one cannot help but empathise with those, at least. 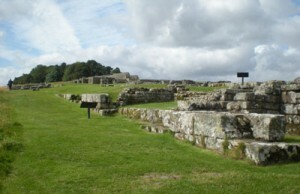 Even if my leanings lie more with the original ones who lived here, and who battered at Housesteads and the Wall whilst wishing the invaders to their hell. And then we saw the Wall. It really rather crept up on us. We were walking up through the fort, reading the signs interpreting what those ‘small walls’ were, visualising the entire fort as a populated entity, busy and almost cosmopolitan as opposed to the barren, wind-swept rocks that remained… and walked up to the edge of the fort where it met the Wall. Before us the Wall snaked down, across dales and hills, east and west, a centuries-old ribbon of rock that divided so-called ‘civilisation’ from just-as-so-called ‘barbarian hordes’. Amazing Spouse is more sensible. He makes enjoyment from such moments. They tend to overwhelm me, and I appreciate that he makes me smile. Don’t get me wrong; objects made by humans are no more special, no more amazing than the things that nature Herself forms, or the tools animals can fashion. A grove of ancient trees has just as much life and magic as any ‘wonder of the world’ wrought by the puny humans upon Her surface. That grove of trees is doing just fine without me–likely would be better off so. 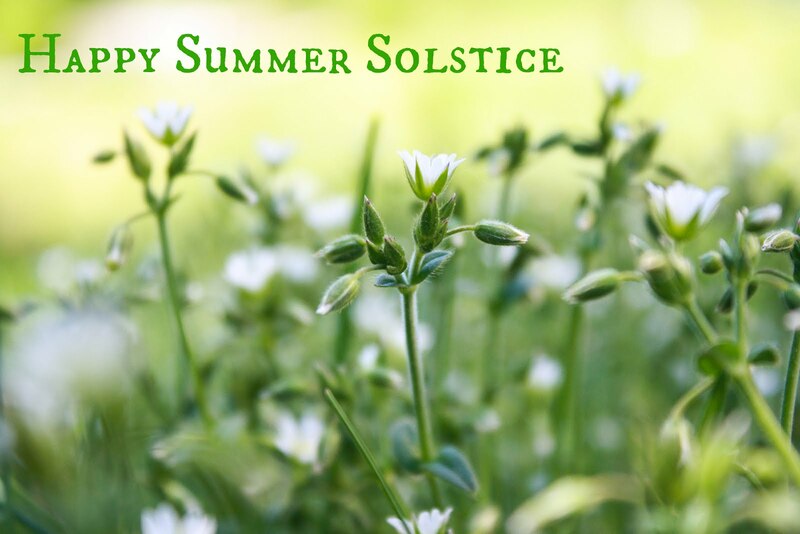 Nature is part of us. We are star stuff, as Carl Sagan rightly said–but we’ve turned into damned invasive stuff. So, right or wrong, the ways humans have tried to shape and live in this world make deep connections within us that we cannot deny. We are, through a chain of cosmic accidents and survivals and happenings, human. And what humans have done to manage and thrive and, unfortunately, subdue this small starship we live upon has a powerful pull over us. I feel kinship with an ancient forest, but also the intruder. 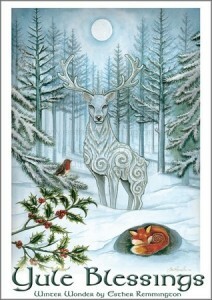 My spirit recognises home, but the rational part of me knows what my kind has done to forests, needful or greedful. When I walk historical sites, there is, even more, an irrevocably and undeniable connection to who made them. We walked the Wall. A grove of trees protects it, and a trail pounded by many feet emblazons the path. 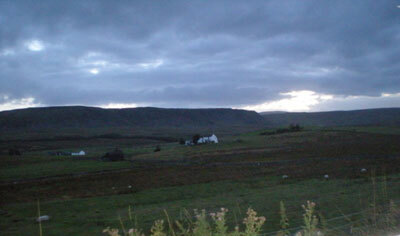 The valley slopes down into the North lands, where my ancient ancestors fought a battle that, perhaps, wasn’t in vain. The Roman intruders built this amazing ribbon of visible might, but they never conquered any farther than the stones beneath my feet, and eventually, they abandoned Britain. I was no intruder, felt no hesitation. Respectful, yes, of all the time passed, of the age beneath my feet, of the prices of achievement, be they ill and fair. Knowing that two descendents of those prideful, powerful tribes were walking a barrier that had so infuriated them. Thinking of conquerors, and conquered, and unconquered hearts on both sides. Perhaps the Wall didn’t win… but it did win me over. Caves! Haunted Dungeons! Expensive Parking! 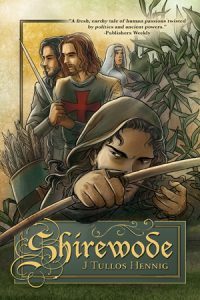 And in the process, comment and have your name put in for a drawing for the e-book of your choosing: either Greenwode or Shirewode.